From The Triall of Lieut. Collonell J. Lilburne by an extraordinary Commission of Oyear and Terminer, at the Guildhall of London, the 24, 25, 26 of Octob. 1649 Unto which is annexed a necessary Appendix, Published by Theodorus Verax (Southwark, 164). 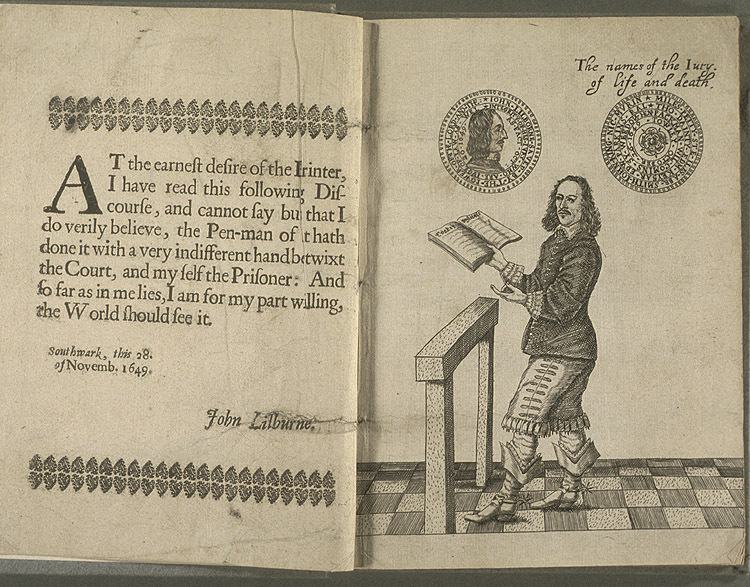 John Lilburne (1615-1657) was a leader in the Leveller movement of the 1640s and was a prolific pamphleteer who defended religious and individual liberty. He was imprisoned several times for his views and was active in the army of the New Parliament rising to the rank of Lieutenant-Colonel. In October 1649 he was arrested and tried for High Treason for printing and circulating books and pamphlets critical of the government but was acquitted of all charges by a jury of his peers. He defended himself vigorously in court, quoting from the works of the great jurist Sir Edward Coke. In this rather triumphant drawing we see Lilburne (or "Free-borne John" as he was called in reference to his constant quoting of the rights of all free born Englishmen) lieterally standing before the bench and reading from a copy of Coke's Institutes (or commentaries on the laws of England). A close up of the book he is holding in his hand shows the title "Cooke's Institutes" (Coke is prounced "cook"). Note also Lilburne's elegant dress, hairdo, and especially his boots. It is unlikely he would have looked like this after the poor conditions and the mistreatment he would have got in an English prison of the period. Upon this Chapter , as out of a roote, many fruitfull branches of the Law of England have sprung… This Chapter containeth nine severall branches. [Source: Sir Edward Coke, The Selected Writings and Speeches of Sir Edward Coke, ed. Steve Sheppard (Indianapolis: Liberty Fund, 2003). Vol. 2. Chapter: Magna Charta. </title/912/224511/3691235>. Stephen Iles, Friday-street. Edward Perkins Smithfield. Abraham Smith, Smithfield. Ralph Packman, Smithfield. John King Smithfield. William Cummins, Cheap. Nicholas Murrin, Gosling-str. Symon Weeden, Bredstr. Thomas Daintie, Cheapside. Henry Tooley, Bredstreet. All good men and true. Printed in the fall of Tyranny. 1649.